Present your best items with Auctiva's FREE Scrolling Gallery. Please scroll down the page to see additional photographs of this item. 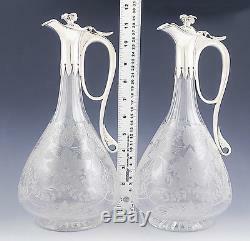 1974 Fab Pair English Cut Glass & Sterling Silver Liquor Bottles Decanters. 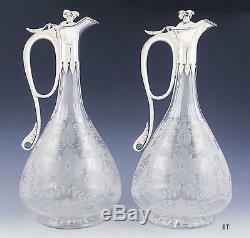 Presented is a great pair of English cut glass and sterling silver bottles or decanters. The sterling silver portion dates to 1974 and was made by the Crichton Bros. The glass may be older, but we don't know. 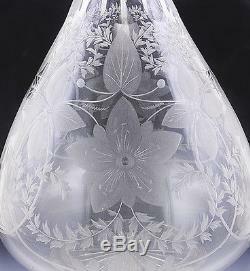 The glass is beautifully cut and frosted with floral and foliate designs. The underside of each bottle has a rayed starburst design cut in. The glass is unsigned, but the quality easily suggests a fine English maker like Webb. 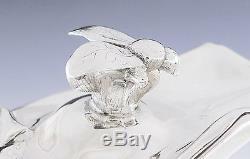 The lid, handle and collar are sterling silver, with a leaf design on the handle and a bee finial on the lid. The decanters are in great condition. The glass has no chips, no cracks, no breaks, no discolorations, and no repairs. The silver has no splits, no dents, no monograms, no monogram removals, and no repairs. Each piece is hallmarked on the side with the lion passant for sterling silver, the leopard's head for the city of London, the date letter t for 1974, and the maker's mark for Lionel Alfred Crichton/Crichton Bros. The lids are also hallmarked with the lion passant and the leopard's head. Each decanter stands about 11 3/4 inches tall. The total weight for the pair is 2432 grams. Powered by SixBit's eCommerce Solution. The item "1974 Fab Pair English Cut Glass & Sterling Silver Liquor Bottles Decanters" is in sale since Sunday, February 14, 2016. This item is in the category "Collectibles\Barware\Decanters\1970-Now". The seller is "bubbleking" and is located in Essex, Massachusetts.